Ms. Pac-Man is a 2D maze game where players must consume all the dots in each maze while picking up power ups, bonus points, and avoiding ghosts out to get you. The original game was released in arcades and many console ports have been released, but many of them failed to be accurate to the arcade version due to hardware limitation. 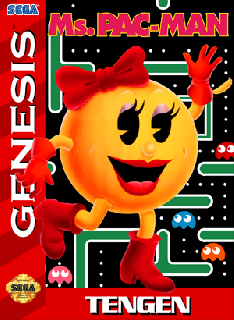 The Sega Genesis version is one of the most arcade accurate ports of Ms. Pac-Man as it enhances the speed, graphics, and sound of the original rather than downgrading it. This version even adds some new content such as two player mode, four extra mazes, and an option to increase the speed of the game. You can also check out the SNES version for a similarly enhanced experience. Now you can add videos, screenshots, or other images (cover scans, disc scans, etc.) for Ms. Pac-Man (USA, Europe) to Emuparadise. Do it now! If you haven't noticed yet, we have a retro game of the day feature (top-right of the screen) wherein we feature a new retro title every single day! Now, you can vote for your favorite games and allow them to have their moment of glory. Click on the button below to nominate Ms. Pac-Man (USA, Europe) for Retro Game of the Day.